Watch this space for more information over the coming days. So What’s All This About a Matrix? In a previous post I mentioned that replacing a single LED in the centre of a matric would be murder and so it will be. The matrix I have in mind is an 8 x 8 x 8 LED cube controlled by a Netduino board. 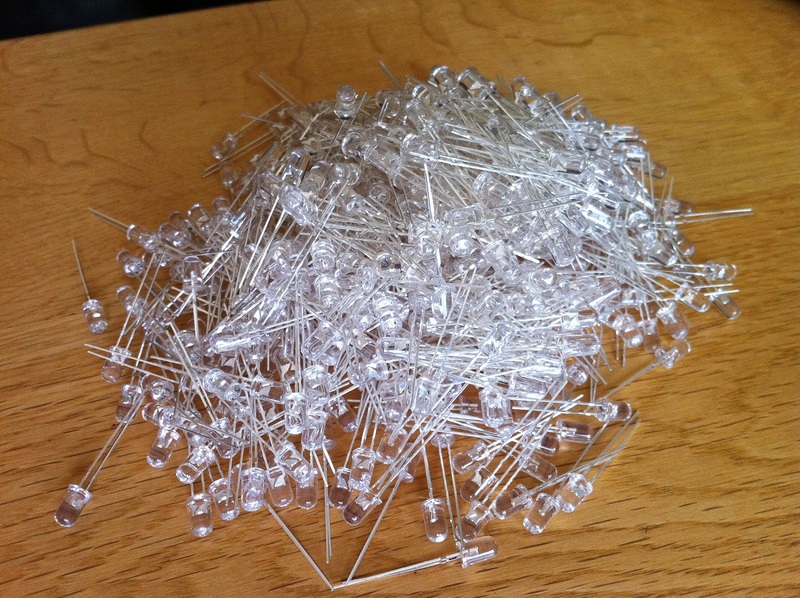 Now it should be obvious that there are not enough pins to connect 512 LEDs to the Netduino without some magic being involved. This is where the Persistence of Vision post comes into the picture. 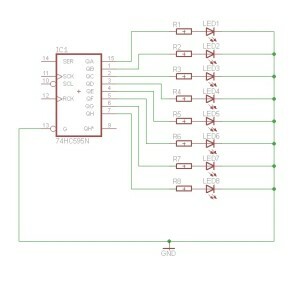 In theory, it should be possible to control an array using a group of shift registers and a multiplexer circuit. So for the next few weeks this is what I’ll be looking at. The previous post on Persistence of Vision had a simple while loop which allowed 16 LEDs to be controlled from the main program loop. In the final program this will be too cumbersome and timing is almost certainly to become an issue. To overcome this we will need to have the display logic separated from the control logic. This will allow the display to be continuously updated whilst the main program loop is working out what should be displayed next. The following tests this concept by turning on on LED at a time in a bank of 8. If this project has a chance of working then the 8 LEDs should all appear to be switched on permanently. 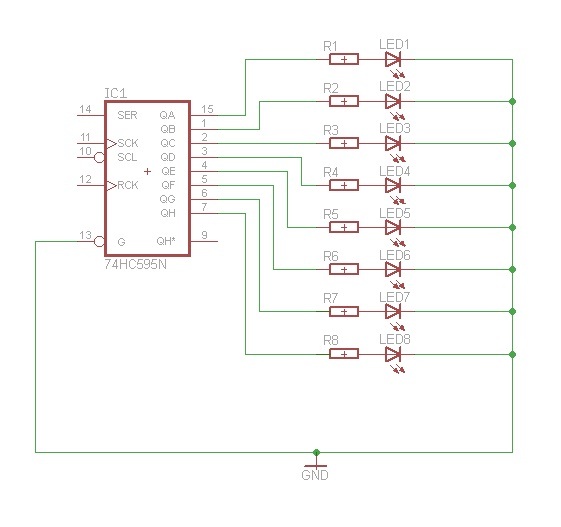 /// SPI bus to use to send data to the shift registers. /// Buffer holding the display data. /// Constructor for the LEDCube class. /// Main loop which continuously updates the display from the buffer. /// Change the byte in the display buffer. Much of the code should be familiar, we have the SPI bus and config variables along with a constructor to make a new instance of the SPI bus. The new code is really the DisplayBuffer and the UpdateBuffer methods. DisplayBuffer is the method which has replaced the part of the main program loop which outputs the data to the SPI bus. This method is run in it’s own thread. UpdateBuffer simply copies new data from the caller into the display buffer. Note that both of these methods use locking to ensure that the methods are thread safe. A new LEDCube is created and at first this is not running in it’s own thread. The next two lines create and start a new thread. The thread is executing the DisplayBuffer method. We then start the main program lopp which simply sets each bit in a byte and the updates the buffer in the cube using UpdateBuffer. Next step, build the control logic for 512 LEDs. Posted in Electronics, Netduino, Software Development | Comments Off on So What’s All This About a Matrix? What do you do with 600 LEDs? Delivery, 600 blue LEDs and a bunch of components. So if I’m going to work with these I need to test them first – replacing a single LED in the middle of the matrix is going to be murder so better make sure they are all good to start with. Grab a resistor, power supply and a glass of wine. Be back later. Posted in Electronics | Comments Off on What do you do with 600 LEDs?